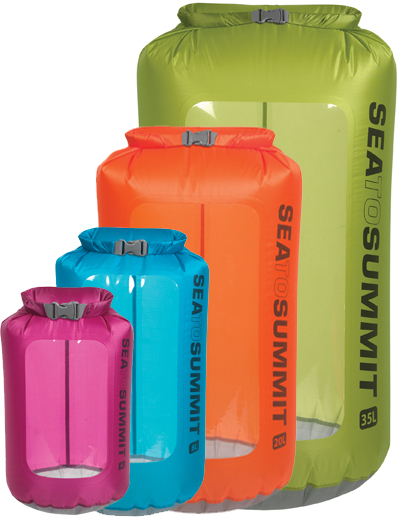 The Sea to Summit Ultra-Sil View Dry Sack is available in seven individual sizes ranging from 1 L (61 cu in) to 35 L (2136 cu in). It is available in Orange, Berry, Blue and Green. The manufacturer updated and added to the Ultra-Sil Dry Sack line by adding a clear TPU (Thermoplastic polyurethane) window to easily view the contents inside. Sea to Summit states the TPU is then in turn RF-welded into the side panels of the dry sack producing a bond as strong as the materials being joined. The View sack is made with Ultra-Sil 30 denier siliconized CORDURA nylon fabric, and has a 2,000 mm waterhead with a Hypalon (a trademarked polyethylene synthetic rubber) roll top closure. The product is polyurethane coated and fully seam sealed with reinforced stitching and a round base design in all sizes. The original Ultra-Sil Dry Sack offers only a flat base in the smaller models. The company also states that it is "suitable to keep contents dry in any wet situation where the bag is not submerged". I really like the Sea to Summit Ultra-Sil line of products. 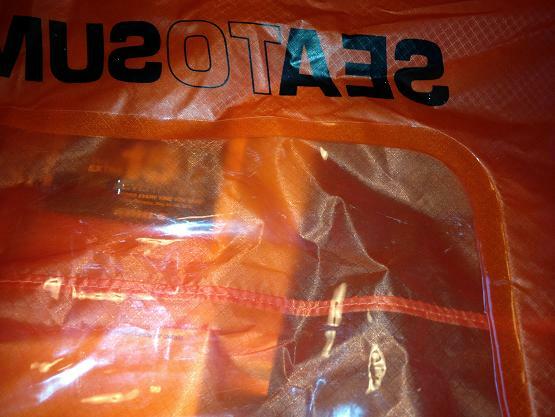 For nearly a year I have been using a 13 L (793 cu in) Sea to Summit Ultra-Sil Dry Sack to store my down sleeping gear. The View version is roughly the same bag with the TPU window added for an easy view of interior contents. The image to the left shows the sack turned inside out in an attempt to show how the window is welded to the silnylon. Also notice a piece of mail underneath the sack. A single layer of the Cordura material is somewhat translucent. Interestingly enough, when I began using non-windowed version I thought the 30 denier material felt paper thin. However, after a year of repeated use and wear and tear, I have become quite comfortable with the durability of this brand. I am also testing another new Sea to Summit dry sack called the Nano, and this 30 D material feels like coarse wool in comparison to those sacks! The siliconized nylon is smooth and slick to the touch. It is not tacky like some other similar products I've used in the past. The viewing window feels thicker when touched, much like an inflatable water toy does. The View dry sack has a 2000 mm waterhead. To clarify this definition I called customer service. They were unaware I was testing the product, but quite friendly and helpful. The following is the gist of the explanation given to me by the Sea to Summit representative. If I were to place a piece of fabric tautly against a tube, and then fill that tube with water, the height in millimeters, 2000 in this case, of direct water pressure is what it would take to penetrate the fabric. This is a non-technical description of the waterhead. The rep stated there is no one single standard on waterproofing in the industry, and I've seen varying answers on the internet in relating to the topic, but he also clarified a hard wind driven rain averaged 2100 mm waterhead. I received the sacks the day before I headed on a trip to St. Thomas, and in an attempt to become more acquainted with them I decided to toss them in with my luggage. I didn't think about it while I was packing, but on the morning I had a dive trip planned I decided this would be a perfect chance to start testing these dry sacks and a way to keep some of my gear dry. The dive boat was small, and there was plenty of sea spray as we motored from site to site. The above image shows the 8 L (488 cu in) Berry (purple) sack with a baseball cap and a rash guard shirt stowed inside. The green sack is the Nano, and feel free to peruse that report on this website as well. The image was captured after I returned from a two tank dive. The sack was subject to plenty of sea spray, and for good measure I dunked it off the back of the boat for around 10 seconds. The manufacturer doesn't suggest this, but I really wanted to give the product a check before I decided to place my down sleeping gear inside it. All the items within remained perfectly dry and I had no issue distinguishing what was contained in the View. I think this product is going to be great for organization. Both sacks I am testing weighed less on my scales than the listed weight, and in my opinion aren't appreciably heavier than the original Ultra-Sil version. To compare the 13 L (793 cu in) one weighs 0.4 oz (5 g) more than the version without the window. These are measurements on my scales. I like to cut weight on the trail, but I'm certainly no gram weenie and I'll take this weight for the convenience of the window so long as it works as well as its predecessor. On the final day of our trip to the islands we spent the morning at the beach and pool before heading for the airport. Our swim suits were wet, so we tossed them into the larger orange sack and rolled it tight. This was an attempt to keep the wet gear from dampening the remainder of our other luggage. This was around noon and once home the final thing I did before going to bed around midnight that evening was to pull the suits from the sack. Nothing outside the sack was wet. There's not much more to add than that! One sack kept things on the inside dry on a dive trip, and the other kept wet items from affecting other things in my luggage. So far I'm quite impressed with the product. The smaller bag also safely transported home a box of cigars rolled up in some t-shirts for protection and...um...elusion. I haven't even officially started field testing the Sea to Summit View Dry Sacks in the backcountry and I'm already impressed with their performance. They are keeping gear dry and I can clearly see the items stowed within the sack. The only frustrating thing about the View is the fact there is no pull tab on the bottom of the sack. When it is stuffed full it can become somewhat difficult to remove the interior items. This is a minor nuisance, and as this is an ultra-lightweight item I'm certain they didn't wish to add precious grams with a tab. 25 - 26 May, 2012: I again camped with my children, but this was in the wooded areas of my family farm near Straightstone, Virginia. Elevations were approximately 625 ft (190 m) and temperatures ranged from 69 F (20 C) to 86 F (30 C) conditions were dry but not humid and the ticks were out in force. During the testing phase I truly believe I put the Ultra-Sil View Dry Sacks through a thorough test, and I've been impressed with them. They are designed to keep gear dry within the confines of a backpack, but I often used them without such protection. 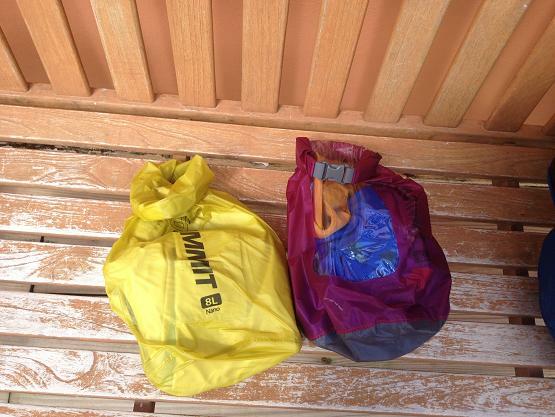 Early on I used them on two dive trips to keep gear and electronic equipment dry. There was a plenty of sea spray and everything remained perfectly dry. 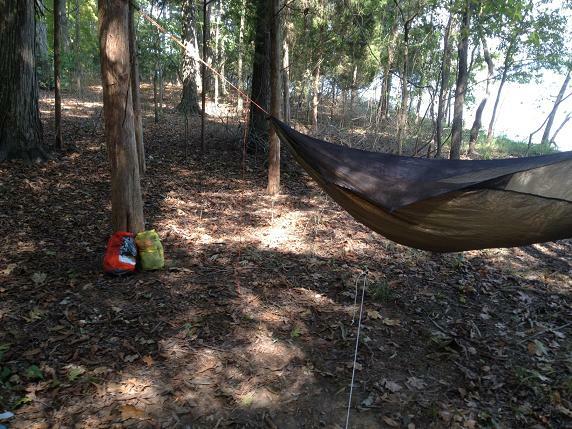 I also used them on a trip to the beach and several backpacking and camping outings on various lakes in Virginia and Tennessee. Most of the five backpacking and camping outings I used the dry sacks on were rain free, but they were still given plenty of opportunity to experience moisture! On the final outing, just before bed my children changed into fresh clothing and I stuffed their dirty garments into a sack and set it just outside the tent vestibule. Although not planned, it was a fortuitous way to test the product since very heavy dew fell in the early morning hours. The tent fly was wet enough to have tricked someone into thinking it had rained, and the dry sack was covered in moisture. I opened the sack and the clothing was dry. 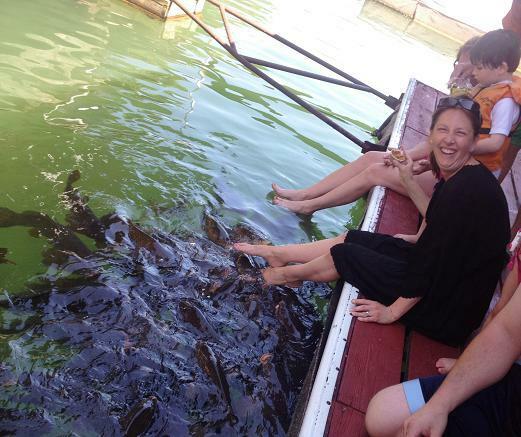 Although they are not designed to be submerged, I pushed the limits a handful of times on my water related outings. Once I submerged a sack for well over a minute to learn that it didn't allow moisture to penetrate to the interior. When I first received the sacks with the view panel I honestly thought it was a little bit of a gimmick, but in retrospect it really was helpful in quickly identifying the items I needed when on the trail. The minimal weight penalty of 0.18 oz (5 g) between this 13 L sack and the same Sea To Summit Sack I have with no viewing panel is not enough to discourage me from using it in the future. I can be a gram weenie, but I'll take the five for the convenience it gives me. There really is not a great deal more to say about the sacks other than that I love them and plan to continue to use them in the future. In fact in late September, I was at an outdoor store in Portland, Maine, and I overheard a customer discussing the Sea To Summit eVent sacks with an employee. His key use appeared to centered on backpacking, so I picked up one of the View sacks and told them both I'd been using these for a few months and they might be the perfect solution. I have two eVent sacks and love them as well, but to be able to get three 13 L sacks for roughly the same weight as one comparable eVent easily causes me to steer toward the View sacks. 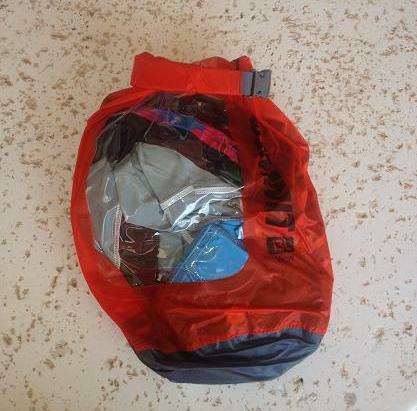 Just like with every product I've ever used from Sea To Summit, I am impressed with the Ultra-Sil View Dry Sack. The company is ever evolving in their research and development, and I continue to be impressed with the items they bring to market. I own no less than seven dry sacks from this manufacturer at this point, and at one point I was considering acquiring an Ultra-Sil pack liner. I'm so impressed with the organization these current sacks afford me at a minimal weight penalty that I don't see myself doing so at this point. My only suggestion to the company is to research and see if a compression sack using this material would be feasible. Heck, they may already have done the research. There are times I would like to compress items like down, and as much as I love my aforementioned eVent sacks, it is tough for this gram weenie to go back that far north on weight. I know a compression sack of this nature would be heavier, but I wouldn't believe it would be drastic. My roses and thorns are unchanged from my initial report. I love the lightweight, waterproof nature of the product and the view panel really helps. I do continue to suggest adding a small pull tab to the bottom of the sack. A half inch tab of grosgrain sewn into the bottom hem would even suffice. 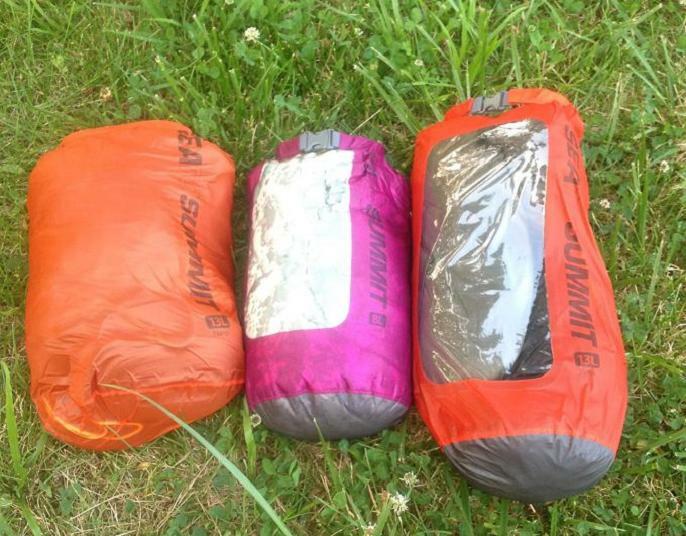 I'd like to thank Sea to Summit and BackpackGearTest for the opportunity to test the amazing Ultra-Sil View Dry Sacks.